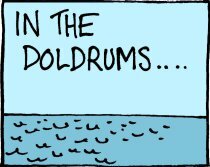 Oh hello, Doldrums, I wasn’t expecting to meet you again quite so soon after our last underwhelming encounter. But here you are at every junction and fork in the road, my little friends the inner critic and the procrastination monkey sitting stoically by your side. So, what’s it to be this time, Doldrums? Because you really have done the not-good-enough theme to death now. What’s that? Oh, you’re playing the even-if-you-were-good-enough-so-are-loads-of-others card. I see. At least you’re showing some originality for once. Top marks for that. Yes, I suppose you’re right, Doldrums, there are a great many talented writers out there who are already taking a slice of the pie, and the laws of physics (or maths? I never was good at those subjects) would decree the pie is getting smaller. And yes, it’s probably also true to say that – talent or no talent – my chances of getting anywhere near the pie in the first place are slim. This entry was posted in Real life and tagged ambition, concern, creativity, critic, criticism, Doldrums, dream, hope, negativity, positivity, procrastination, self-doubt, worry, writing by Belle365. Bookmark the permalink.